Vectrocity is a Flash/AS3 game I created in 2009 for an interactive media course at RIT. It follows the standard “shoot ‘em up” formula: Blast the waves of enemies coming at you, dodge their shots, collect powerups, etc. 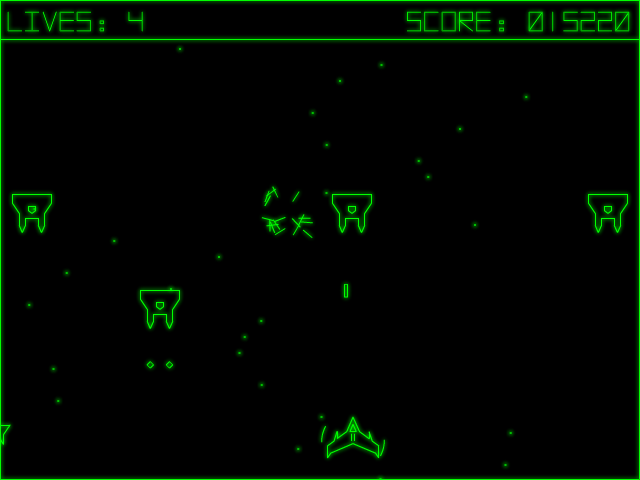 The graphical style is an imitation of various old arcade games like Asteroids that used single-color vector monitors. This was inspired by a bullet point in the project requirements: “Use vector graphics.” In-context this meant “don’t use bitmapped images”, but I realized a retro vector monitor style would really simplify the process of creating the game’s art. To play, extract the package into a new directory and open vectrocity.html.